Bill Backus explains how to recruit, hire and train home agents – from a remote location. In the competitive contact centre labour market, many employers are looking for ways to reduce labour costs and increase retention. One choice is to venture into virtual, work-at-home, customer service. This model enables centres to hire from diverse areas and more easily find those with specialised skills. It also frees up current floor space, reducing future capital expenditures. To take full advantage of the virtual model, a company must update their hiring and training philosophies. Decisions must be made regarding hiring range as well as how training will be undertaken. Recruiting and hiring should no longer be limited to the driving/commuting radius of the contact centre. Taking advantage of a wider area allows companies to increase the quality of applicants available for both agent and supervisor positions. It also makes finding unique talents and bilingual agents simpler because a centre can now recruit within the areas where the needed skills are prevalent. We assisted a well-known greeting card company who used a contract provider located in another state. When we moved those agents to virtual, it allowed for recruiting in their home town where there was a large pool of local applicants who had very positive feelings about this business. It was a win for both the contact centre and the card company. 1. Determine the location(s) where an excellent employee base is located looking at population demographics including education and language that match the type of caller to be assisted. We probably would not want to recruit tech support agents from a senior citizen area. 2. Advertise and post available positions on the local boards. This usually reduces the costs of searching for candidates. Job fairs in selected areas are also effective solutions to finding future employees. 3. Streamline the application to gather only the important information that is pertinent to the call type. Because there is a readily available pool of applicants, use the submission process to quickly eliminate people who are not qualified. 4. Set up 30-minute telephone interviews advising the candidate to be at their computer at the time of the interview. Give the applicant a short explanation of the type of products/services they will be representing. Test the speed of the internet in the applicant’s home office to be sure it meets the minimums set by company IT services. Have the agent perform several browser-based activities to determine their internet IQ. Ask the ‘Big 4’ virtual agents questions. Be sure you can “hear” the applicant smile while speaking. 1. Do you consider yourself competitive? #1 answer … I compete with myself. 2. How would you handle an irate customer (including an example)? 4. Why do you want to work from home/what are your thoughts about working at home? 5. Close interview with a short explanation of the next steps in the process. 6. Choose those applicants who are competitive, have solid empathy, and show knowledge with using a computer independently. 7. Choose a company like E-Signature to process new-hire legal paperwork. Successful agents are the result of great training and preparation. To assure work-at-home new hires become excellent customer service agents, training is modified for virtual use. People learn in different ways. Some retain information better when reading it while others retain better while listening. Younger people tend to absorb information best with interactive training. All of these are included inside virtual classes. Many contact centres take advantage of having virtual agents by moving their in-house training to online also, reducing the number of trainers across their system as well as providing readily available recall for agents when answers about processes, etc. are needed. This guarantees that all agents in and out of the centre receive the same high-quality preparation. Several companies we work with use customer surveys exclusively to determine agent success. We designed training modules to reinforce ways of increasing customer survey scores for use by agents falling below the CSAT metrics. Agents are removed from the phones until they complete the soft skill training. On one occasion, voice-of-the-customer scores increased from 4.62 to 4.81 on a 5-point scale, rewarding the client with a Silver Stevie award for customer service. One major advantage to virtual training is consistency. Because learning is not as heavily dependent on an instructor, agents receive the same quality information from class to class. Live training is reliant on the understanding and ability of the instructor only, while virtual training can include videos of specialists giving in-depth background and demonstrations. Trainees receive tips from top agents, meet their supervisors, and gain a clear understanding of what is expected via these tools. Virtual training is designed to be interactive between the trainer, peers, and systems. Instructors ensure class participation by calling on students to share their computer screens or asking students to demonstrate a process on the instructor’s computer. Roll call, quizzes, breaks, lunches, etc. are noted within the classroom, confirming students are totally involved and time is documented. Using virtual classrooms such as Adobe Connect, learners gather in smaller groups to practise what they have learned. Following provided scripts, trainees go through the procedures over and over as peers, practising application processes and developing soft skills. One new agent will share their screen with the rest as they flow through the actions together. 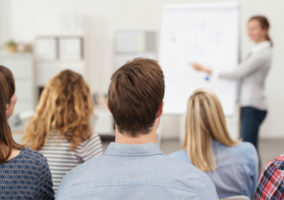 These break-out sessions give the instructor time to move among the different groups, viewing how the training has been received and understood. Training development is not necessarily a costly process. Many online vendors provide platforms that house the training as well as development applications. Training design begins with the basic information sheets and then is augmented by adding videos, animations, and interactive technology. All are meant to provide an immersion into the skills and processes needed for excellence. Some of my clients have used designers found online or in local universities. Finding ways to remove contact centre walls unlocks exciting new ventures into customer service. Hiring is no longer restricted to a small zone and training takes on a whole new way of learning. Virtual agents are the answer to many of today’s contact centre expense issues. However, to be successful, a company must hire the correct people and train them thoroughly. Bill Backus is the managing partner of Backus and Associates, an international consulting company providing management training and virtual customer service solutions.